I have quite a few blank vinyl figures lying around my house. I do custom commissions and it's always nice to have a "surface" ready on hand, so I have a healthy backstock, usually. So this friend started arranging the little toys in different scenarios and at some point, he put a little sky blue "Foomi" on top of a "Blockhead" figure. There were several visits like this, where he would seek out these two little figures, and arrange them as such. He offered at one point, in jest, that he would be interested in buying them from me, at cost, blank because he liked the silhouette and the color combination. My dissapointment must have been clear on my face because he quickly retracted this idea and proposed instead, that the little blue Foomi should be -and I'm pulling directly from my commission notes- angry, Kabuki, rage, whirlwind, and the black Blockhead would be his lumbering steed. Now, I'm sure that there is many an artist that would just run at this, full force, no nevermind to doing any sort of research. That's fine. That's just not how I handle commission projects. I have a weird passion for detail collection. I spent some time researching Kabuki makeup and how these terms that were given to me in reference to what he wanted conveyed by his piece. I then designed the Kabuki figure considering the information and imagery I had collected. 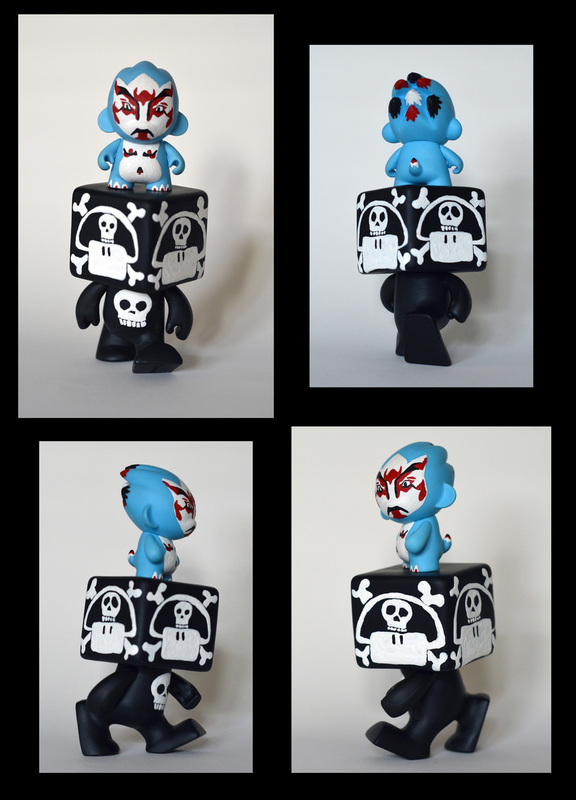 The Blockhead figure wasn't officially commissioned for quite a while. When he finally did decide he wanted the Mario Brother's poison mushroom on each of the faces, he said he wanted each of the faces to be slightly different. Still the same image, but clearly "hand-done" and "not-stenciled" and "non-uniform." When I asked for clarification, and suggested some warping on each face, my client became excited. I sealed the two pieces with a matte varnish. This finish is similar to an eggshell and minimizes brush strokes. The client did not want the two pieces to be separate so he didn't have to display them always together. He was particularly happy with the piece, he told me, because I did go the extra mile and spent some time doing some research instead of just "spitting some paint at the things and handing it to him the next day."